50 Amp RV Site for the 2019 Sturgis Motorcycle Rally. 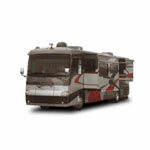 Camp in comfort with one of Glencoe's full service hook up RV Sites. Each site is at least 25' x 75' and has one 50 AMP outet, a private water hookup and sewer drain. These sites are reserved with purchase for the entire time Glencoe is open from 7:00am on July 30th 2019 through 11:00am on August 13th, 2019. You still need to purchase wristbands for every person staying at Glencoe.